You're Invited: Free Online PD in January! Is improving your teaching practice one of your New Year's resolutions? The EiE professional development team can help you with that! They're offering two free webinars to kick off 2018: on January 10, "Getting Started with EiE: Materials Management" and on January 24, "Integrating ELA & Engineering in the Elementary Classroom." In these sessions, you'll learn from the experts as you study classroom footage, get tips you can apply in your own classroom, and more! Read on to learn more about these interactive, one-hour sessions and register today. If you’ve ever seen an EiE materials kit, you know that our units are materials heavy! Hands-on, problem-based activities require a lot of advanced preparation, but the results are well worth the effort. And of course, our PD team is here to walk you through every step! In this session, you’ll get a tour of our online store, learn about creating models and preparing testing stations for your class, and get tons of tips about materials management. Join us on January 10, 2018 at 4 PM EST! In this one-hour webinar, you’ll explore how students engaging in Engineering is Elementary units find practical and meaningful connections to the real world as you watch real classroom discussions and examine student work samples that show evidence of kids meeting writing standards. Through these examples of student work, you’ll be able to see how integration of engineering and ELA enriches students’ knowledge of and engagement with both subjects. Join us on January 24, 2018 at 4 PM EST! These sessions are suitable for elementary teachers of engineering and STEM specialists, as well as professional development providers and administrators who want to learn more about materials management and integrating ELA into STEM classrooms. 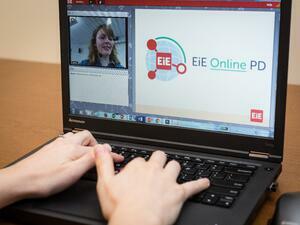 You don’t need previous experience teaching the EiE curriculum to benefit from these engaging webinars! Register today and join us in January to enhance your teaching practice, and check out our online PD recording archive to find recordings of our most recent webinars.